This piano is designed by Andre Miripolsky of the Hollywood Arts Council and hosted by the American Cinematheque at the Egyptian Theatre. 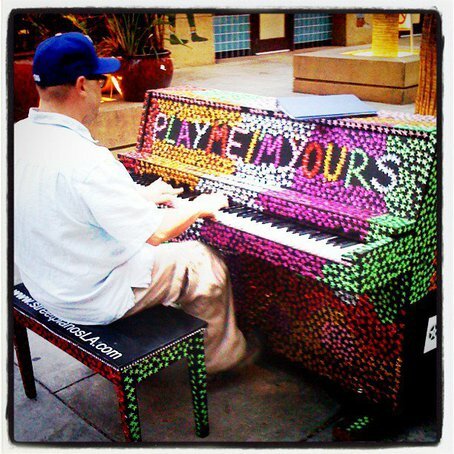 Having worried for the past three weeks whether I'd get to touch, let alone play, a piano this summer, I stumbled onto this gem in Hollywood and played some of my favourite Film and TV tunes! Nitay Winter, improvisation on Twinkle-Twinkle. A short clip of Emily, age 15, on her way to see Coldplay at the Hollywood bowl.. The man with the hat was so funny, and it was playing amazings songs on the piano. 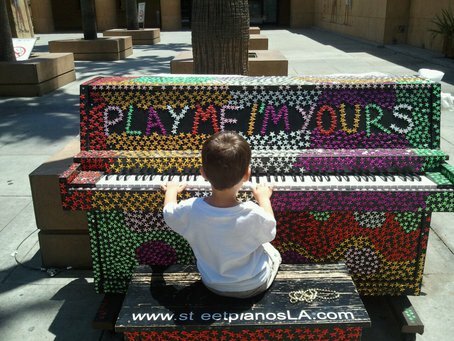 I just met artist Andre Miripolsky at an art walk event in East Hollywood and he told me the LA Chamber Orchestra donated this piano to American Cinimatheque, who decided to leave it where it is! 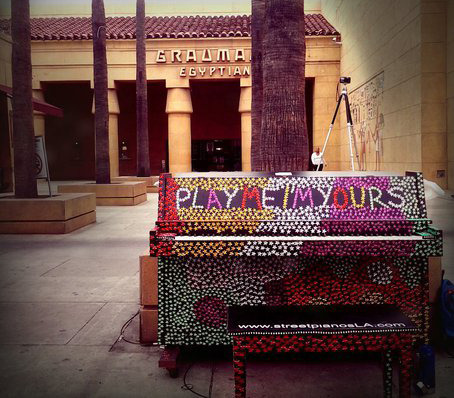 So this piano is still yours to play! Jess Delgado sings a cover of The Beatles' "In My Life," accompanied by Neara Russell on the piano. 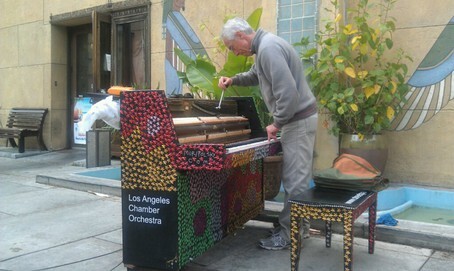 Thanks to Los Angeles Chamber Orchestra, 30 pianos were scattered around Los Angeles for anyone to play. Here's the 7th track off Hammers & Strings EP, "Miss Me Now," live out front the Egyptian Theater in the heart of the Hollywood/Highland walk of fame. The sparkling stars on this one made my day! Thanks Andre! Don't know if this is a kindly stranger or if the Chamber of Music sent him, but he's tuning the piano up for us! Grimace Boyer on piano 4/22/2012. Found this star studded beauty while taking a self-guided tour of Hollywood provided by angelswalkla.org. Thanks for the experience!